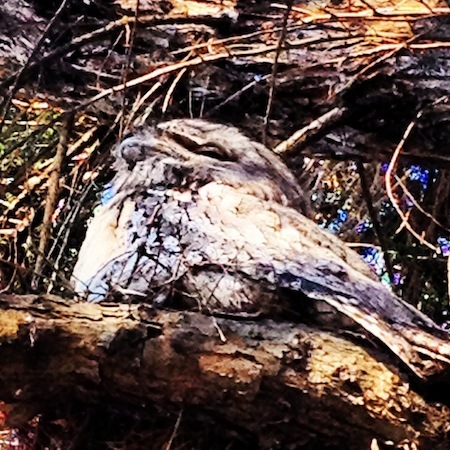 Having had a family of Tawny Frogmouths outside my window I came to know that they are not owls. Owls are very important to me; so much so that my 16 grandchildren have been gifted with all kinds of owl trinkets to place on my coffin after I die. I’m not dying yet! 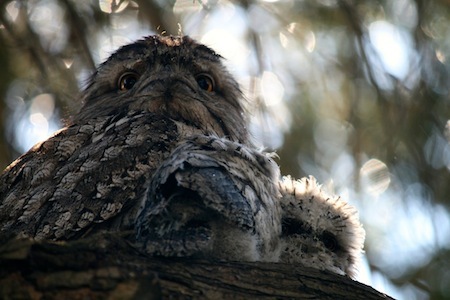 Yes I learned that they were not really owls from one of the other watchers. I was a bit lax to call them that. They are wonders, aren’t they? And do you know, when my mum was dying, she read that book. I actually have it by my bed to read over Christmss. Only nineteen years later! Don’t go yet. Good to be ready, but try to stay a while longer! Amazing how potent it can be to have any kind of exchange with a wild creature, isn’t it? I think it calls to something in us. Something we forget about in the day to day of our civilised lives. Beautiful. I’m glad they are still with you. Ah …. fly well my friend! May the owl-force be with you. So you should be able to see them again next year if you are lucky. Thank you as ever, Darren. I love the hope in that last para. Maybe we will look up one day and they will be back. Wouldn’t that be something? I wish you owls and other delights at Christmas. Thanks for the info. And for a your contributions to my year. Peace. This was sent to me today by Andrew, regular correspondent via the blog. I thought it so lovely that I wanted to put it here for those of you who read the comments. A little extra treat! Thanks Andrew. The ultimate source of the Susquehanna River was a kind of meadow in which nothing happened: no cattle, no mysteriously gushing water, merely the slow accumulation of moisture from many unseen and unimportant sources, the gathering of dew, so to speak, the beginning, the unspectacular congregation of nothingness, the origin of purpose. And where the moisture stood, sharp rays of bright sunlight were reflected back until the whole area seemed golden, and hallowed, as if here life itself were beginning. This is how everything begins – the mountains, the oceans, life itself. A slow accumulation – the gathering together of meaning. Re: “The ultimate source of the Susquehanna River was a kind of meadow”. I have a friend in the UK who goes under the name of King Uke and he likes to write his own songs and tunes. It’s been a long time since I posted to your wonderful blog. Not from lack of interest or attention, believe me. Your gorgeous pieces are always so uplifting and sweet and your messages so touching. It’s been a busy and enriching time for me and my husband and many changes in our working and writing life , and some special things on the drawing board for 2014. Suffice to say, I sucked in all your lovely, kind, elegant and thoughtful New Year wishes and applied them directly to me ( all about me, isn’t it???) as always and would like to return them likewise to you. Many many good wishes in all your endeavours and may your talents and dear heart works go onwards and upwards . 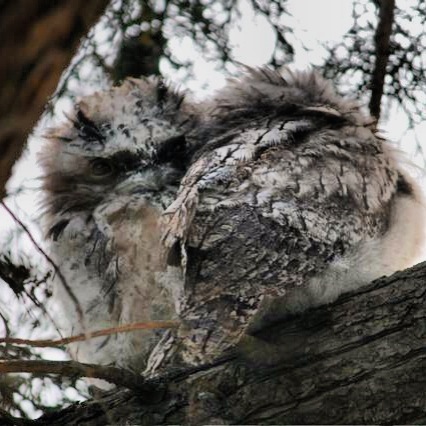 I have only fleeting owl experiences of lovely Tawny Frogmouths who land on our verandah railings, gum trees and front fence and stay a day or three and leave. But I note that every time I tell an owl story, the listeners’ faces melts into rapture, and a special look creeps into their eyes. Magical creatures aren’t they! You always write with such lightness and tenderness. Thank you. I picture you inhaling scents in your summer garden, your smile shaded by a wide brimmed straw hat. Hope there are moments like that. May 2014 be a year of benign and sunny surprises and may we continue to walk together in cyberspace. Love and every good wish. Enjoyed reading this piece on the Owls. 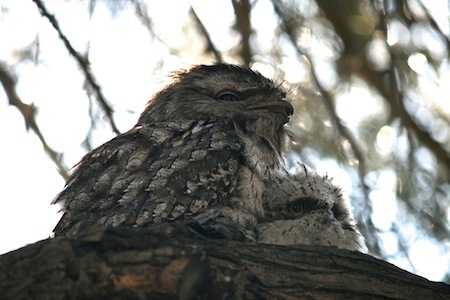 In East Doncaster, where my duaghter lives we first saw parents and 3 babies (Tawny Frogmouths) about 4 years ago in an old gum tree in an abandones garden. Had to send letters to the council to save the tree! We are glad we did as they returned a year or two later and again a few weeks ago – two grown chicks!